Born in Reno, Nevada to William S. and Elizabeth Day Bender, relatives of Margaret Crocker, Elwood was adopted by Edwin and Margaret following the death of his parents. He later went to live with Jennie Fassett in Elmira, New York. 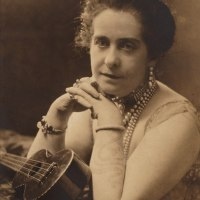 As the most colorful member of the Crocker family, Amy (later Aimée) enjoyed an exotic and indulgent lifestyle. Her audacious autobiography, entitled And I'd Do It Again, shocked readers when it was published in 1936. She married five times, including a union with the European Prince Galitzine. She had one daughter with her first husband R. Porter Ashe and later adopted Yvonne and Reginald while married to Jackson Gouraud. She died in New York in February 1941. Jennie Louise Crocker married attorney/businessman J. Sloat Fassett in February 1879 and moved to Elmira, New York. A champion of the fledgling gallery, she contributed $10,000 in 1911 toward the City’s purchase of the former Crocker family home to provide additional gallery and office space. Her many excursions abroad with her husband included a 1912 visit to Korea, where they were among the first westerners welcomed by the Royal Court. These travels inspired Jennie to collect Korean ceramics, fine jade, ivory and sculpture, all later gifted to the Museum’s permanent collection. 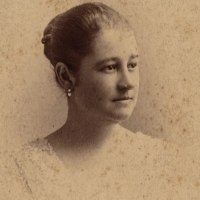 Correspondence exchanged between Nellie and her beau, William A. Beck (Deputy of Secretary of State), reveals a more personal view of the Crocker family than any other surviving source. 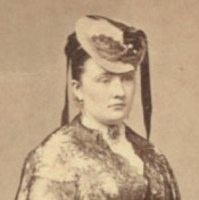 The letters, invitations and telegrams, written in 1879, refer to family visits to Lake Tahoe, dinner parties at the Crocker home, and Nellie's trip East to visit her half-sister Mary in New York City, her sister Jennie in Elmira, and family friends in Baltimore. Nellie, who never enjoyed robust health, died suddenly on December 27, 1879 in New York. Edwin Clark, only son of Edwin and Margaret, was born in 1856, but died 16 days later of whooping cough. 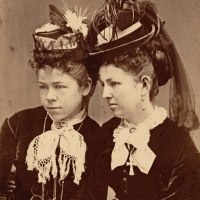 Kate (left), the eldest child of Edwin and Margaret, was born in 1854 in Sacramento. She pursued an active interest in art and was a student of Charles Christian Nahl. Her paintings were included in the prestigious San Francisco Art Association exhibitions. She married James O. B. Gunn in February 1874, but died soon after on October 26, 1874. 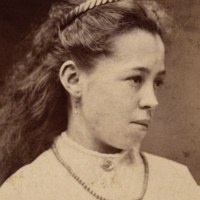 Edwin's daughter by his first wife was born in 1848 in South Bend, Indiana and named after her mother. She joined her father and stepmother, Margaret, in Sacramento sometime after 1852. 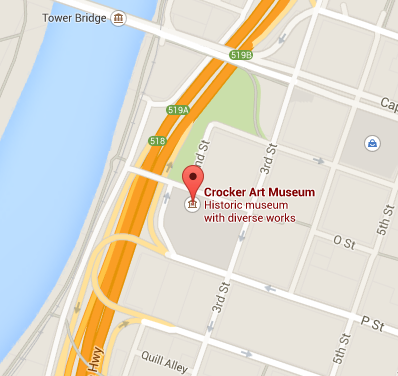 In November 1864, she married Charles Scudder, a bookkeeper in Sacramento. Edwin entrusted the management of his art collection to Charles, and in 1873 commissioned a home to be built for his daughter and Charles at the corner of Third and P Streets. They later divorced, and Mary married Myron P. Walker in 1878 and moved to New York. Margaret, the youngest of twelve children, was born shortly after the death of her father. When her mother also passed away, Margaret went to live with a married sister, Anne Bender, in South Bend, Indiana. Here she sang in the local choral group, which is where she met Edwin and Mary Crocker. Following Mary's death, Margaret accepted Edwin's marriage proposal and joined him in the treacherous voyage to California. During most of her married years, Margaret's activities were devoted to family, church and the community. Like her husband, she was an ardent abolitionist and devoted time and money to charitable causes. 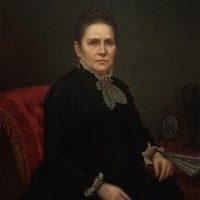 After her husband's death in 1875, Margaret emerged as a social and civic leader. Her most significant philanthropic act was to present the "Crocker Art Gallery" and the bulk of its collections to the City of Sacramento and the newly formed California Museum Association in May 1885. She maintained an active interest in the Gallery through membership on the CMA Board, and she provided scholarships to students attending art school in the Crocker galleries. During the next several years, Margaret maintained residences in Sacramento, San Francisco, Lake Tahoe, Los Angeles and New York. In 1900, she donated her Sacramento home to the Peniel Rescue Mission, her last public gift to charity. She died on December 1, 1901 in New York, and her ashes were returned to Sacramento to be placed in the family plot at the City Cemetery. Edwin Bryant Crocker was the eldest of five children born to Isaac and Elizabeth Clark Crocker. He grew up in Troy, New York, and attended the Rensselaer Institute (now Rensselaer Polytechnic Institute) where he earned a degree in civil engineering. He later studied law in South Bend, Indiana, where he established an impressive practice and a reputation as a staunch abolitionist. His first wife, Mary Norton, died in the late 1840s, leaving him with a young daughter. He married his second wife, Margaret Rhodes, on July 8, 1852 in New York. The ceremony was performed by Henry Ward Beecher and took place only a few days before the newlyweds booked passage to California, via the Isthmus of Panama. They arrived in San Francisco and made their way to Sacramento. Once established in their new home, Edwin resumed his legal career. In 1854, he became the chair of the newly formed Republican Party, which was committed to promoting national unity, opposing the spread of slavery, and encouraging a transcontinental railroad. Party victory came with Lincoln 's election as President and Stanford's election as California governor in 1861. 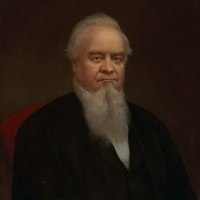 Because of his expertise in common law and his prominence in party politics, Edwin was appointed a State Supreme Court Justice in 1863. During the seven months of his service, he handed down a record number of opinions. In 1864, Crocker accepted an offer to serve as legal counsel for the Central Pacific Railroad Company, a company organized by Leland Stanford, Mark Hopkins, Collis P. Huntington and Edwin's brother, Charles Crocker. In June of 1869, Edwin suffered a stroke, leaving him partially paralyzed for the rest of his life. He retired from the railroad business and pursued other interests. These interests included renovation of the family's new home, commissioning an art gallery building, and embarking on a Grand Tour to Europe with his family from 1869 to 1871. The family moved into the new home in 1872, and installation of the galleries was completed in late 1873. Unfortunately, Edwin was not able to enjoy his collection or magnificent gallery for long, as he died on June 24, 1875.